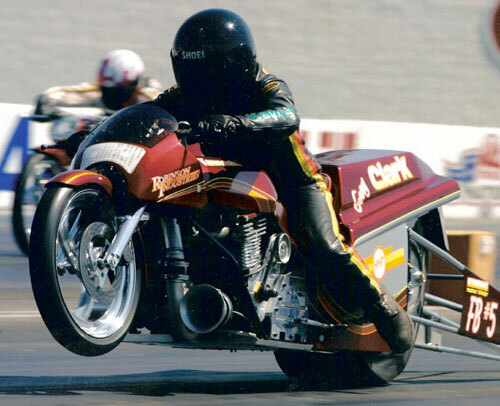 Several times in the past on the Cycledrag.com Facebook page (please like and share) the question was raised, how quick could a modern Funny Bike, turbo-charged, wheelie bar machine, run if all of the most modern technology, engineering and data was used? Would a five second run be plausible? 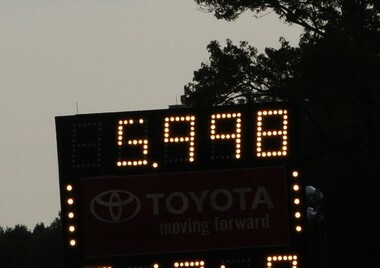 No one has come within two-tenths of a second of running a five-second turbo run. But with Funny Bike no longer an official class, not having been one in more than a decade, has anyone really tried? 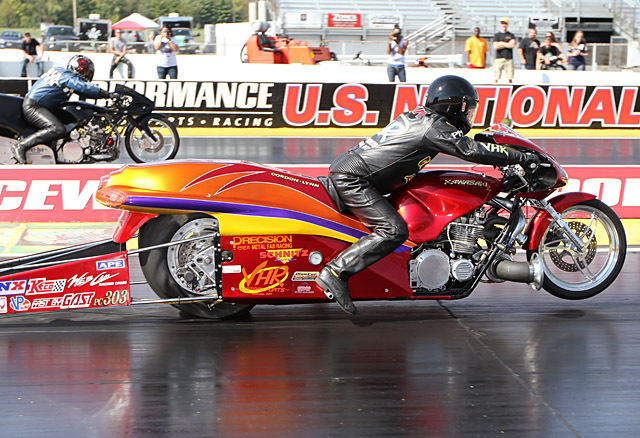 Perhaps because of the expense combined with the category’s uncertain spot in the sport, no one has assembled a Funny Bike using the same high level of technological advancements as competitors in the Pro Street and Pro Extreme/Pro Mod classes. With Pro Extreme motorcycles running threes to the eighth-mile mark, including Ehren Litten’s turbo-charged entry, and Joey Gladstone running 6.50s on a small-tire, no wheelie bar, turbo Hayabusa Outlaw in Pro Open, would a modern Funny Bike, if built right, run in the five-second zone? This topic lead to more than 250 comments on the Cyceldrag.com Facebook page. 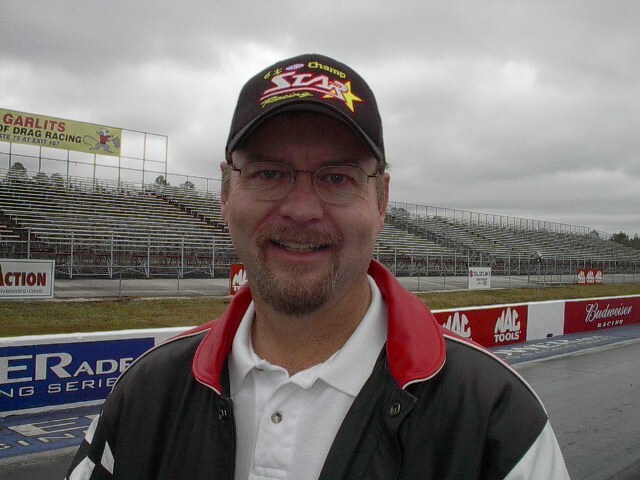 On one side of the debate was the legendary and vocal Billy Vose, who does believe a modern turbo dragbike would be in the fives. Skip Gladstone, Aubrey Hahn, Joey Gladstone, Dimey Eddinger and Bill Hahn. 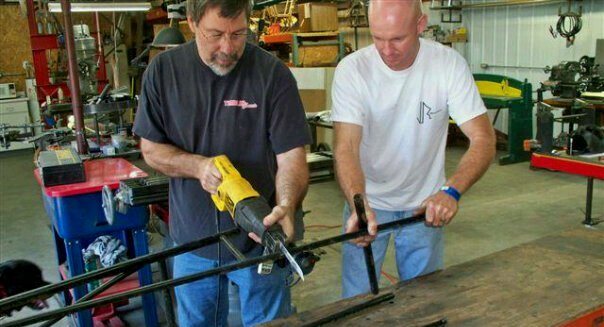 We consulted with a chassis expert, a man who many have credited for the tremendous improvement in performance in the Pro Extreme class, frame builder Walt Timblin. 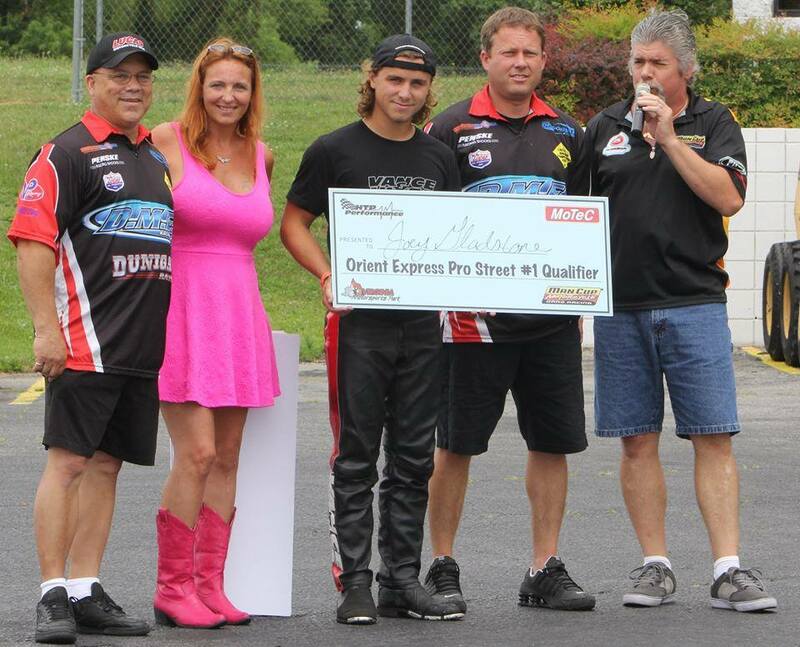 Walt Timblin has improved the Pro Mod Chassis a great deal. Timblin points out how the quickest Funny Bikes of yesteryear used 13-inch Goodyear slicks and skinny rims. Timblin says that combination has been greatly improved. 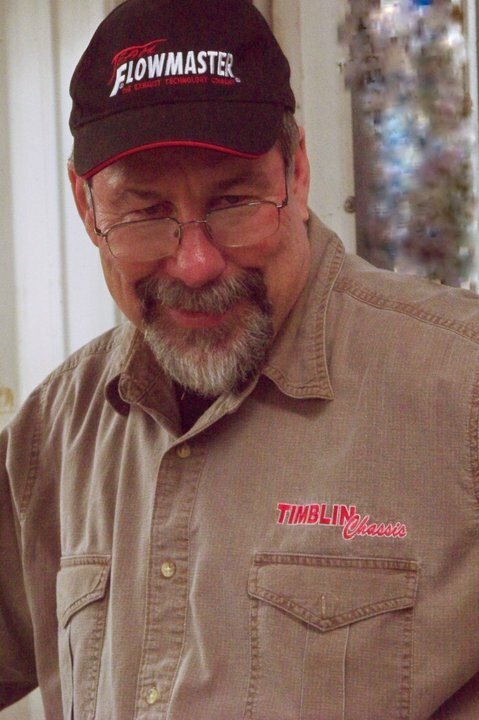 Gary Clark, 1959 -2015, rarely needed his front wheel on a Funny Bike pass. 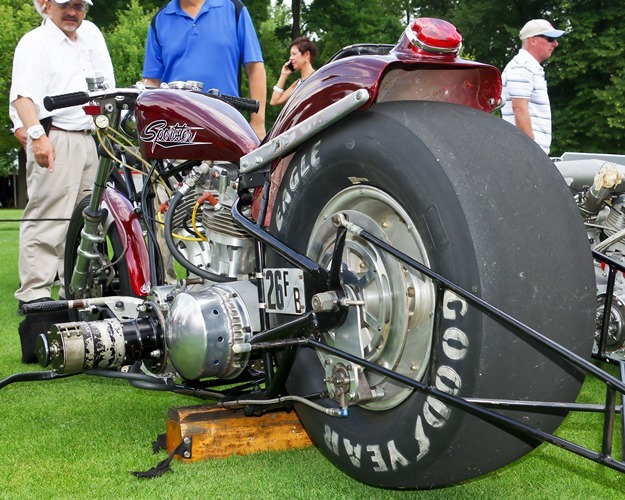 A modern day Pro Mod set-up uses a 10.5-inch tire with a 13 or 14-inch wheel. Like Vose, Timblin thinks a Funny Bike would find much better performance running this combination as opposed to the giant slicks. Larry “Spiderman” McBride knows what it takes to run fives. 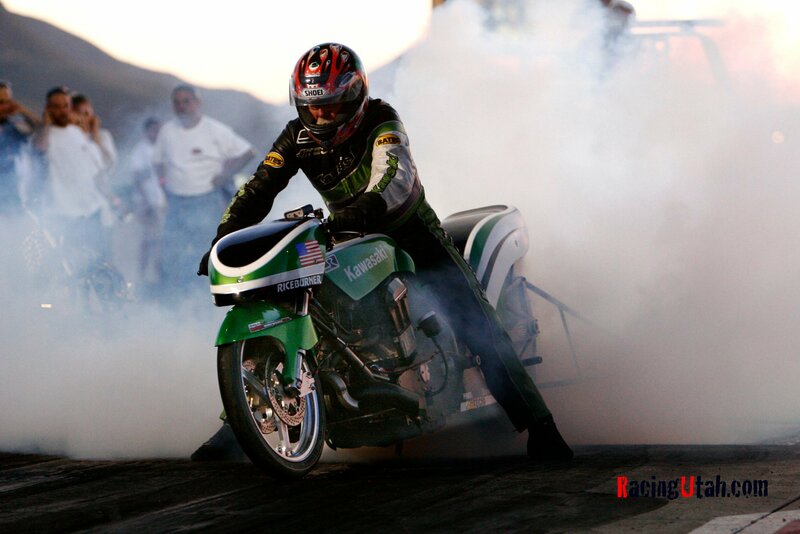 He was the first motorcycle drag racer to accomplish the historic feat in 1999. Larry “Spiderman” McBride knows what it takes to leave the line hard. 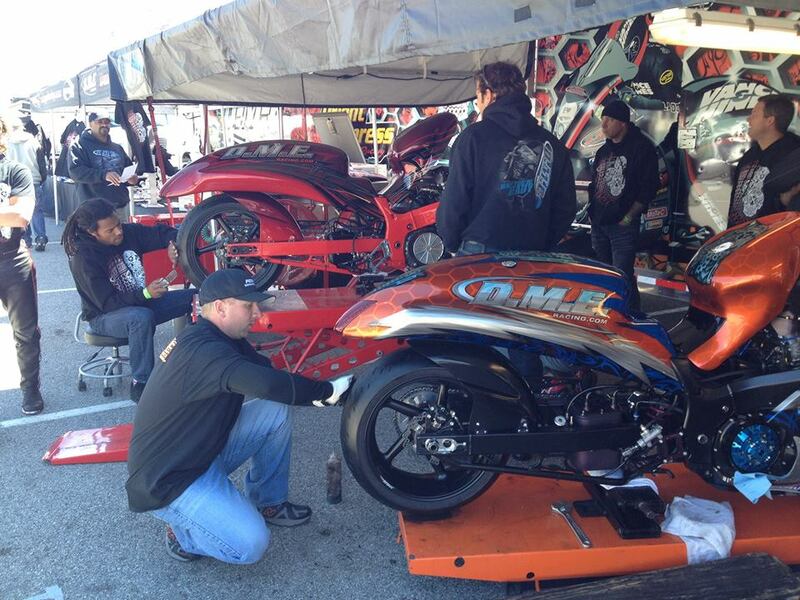 Current Pro Mod/Pro Extreme Bikes can run in the 6.20-6.30 range, or better, in the quarter-mile right now. Eric McKinney has one of the quickest PXMs out there. 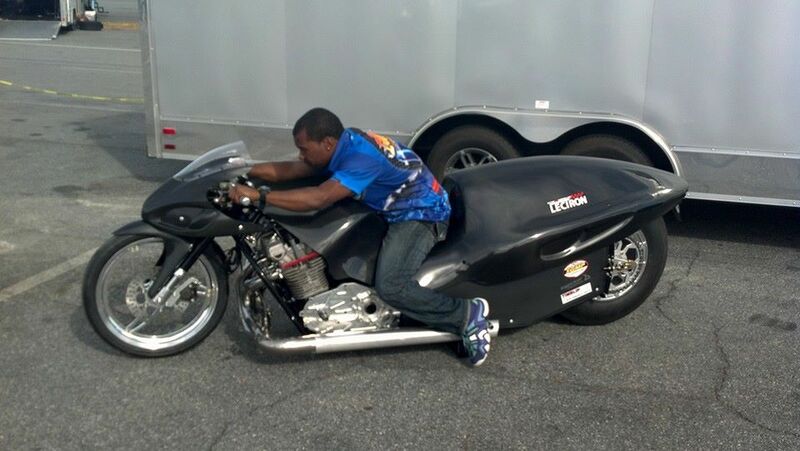 Eric McKinney and his ultra-quick Pro Extreme Motorcycle. 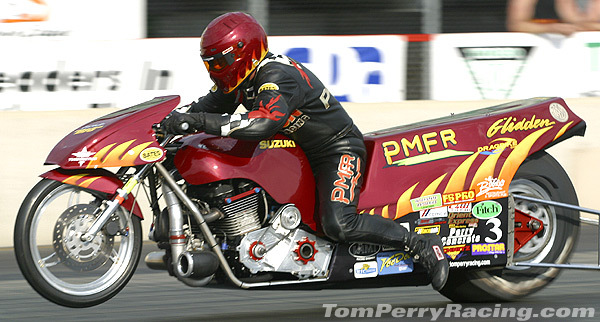 Tom Perry had one of the quickest Funny Bikes for many years. The demise of the once-thriving Funny Bike class and the gravitation of turbo gurus to no-bar racing are factors that have held back the progress of turbo-charged bar bikes. Timblin says lack of commitment and participation is what led to the Funny Bike demise. Travis Davis, who once dominated Funny Bike. 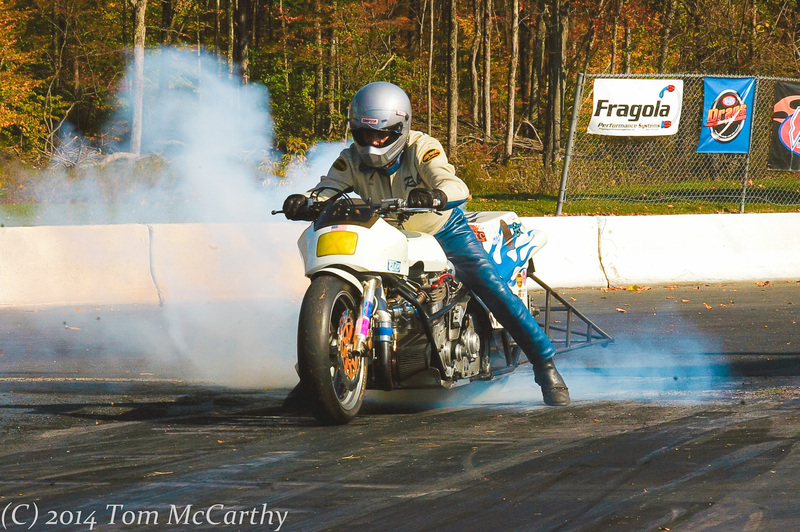 Funny Bike has a long and storied history in the sport of motorcycle drag racing. 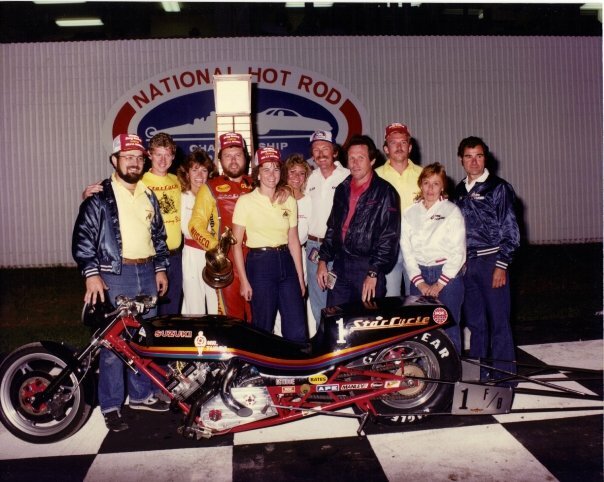 Before George Bryce of Star Racing was a six-time NHRA Pro Stock Motorcycle championship-wining team owner, he was a standout Funny Bike racer. 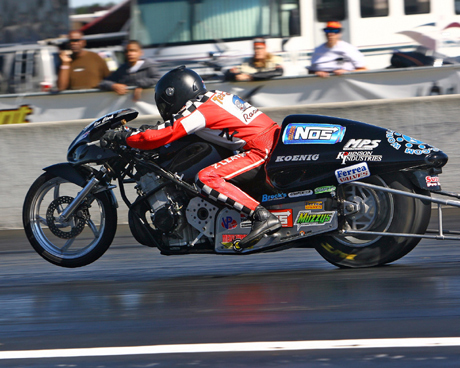 Bryce won Funny Bike titles in the IDBA, NMRA, and he won the prestigious NHRA U.S. Nationals. 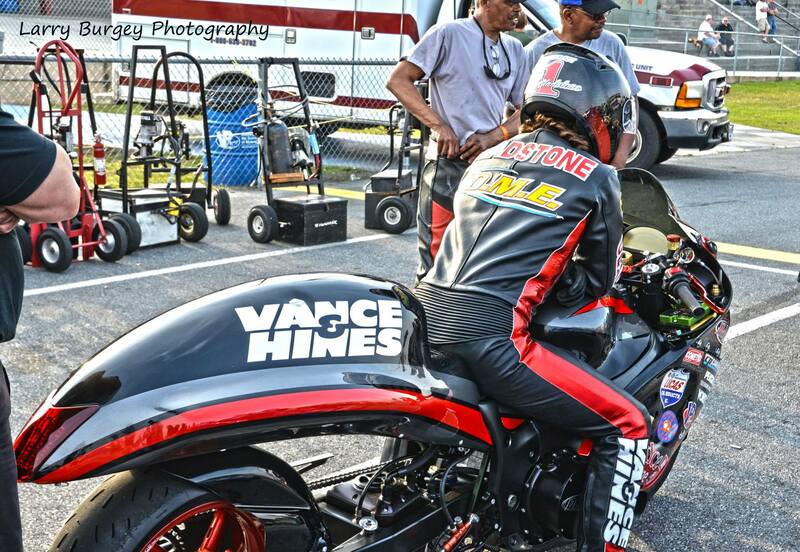 George Bryce’s Suzuki Funny Bike in the NHRA U.S. Nationals winners circle. Bryce feels his team could build a five-second Funny Bike with enough time and money. 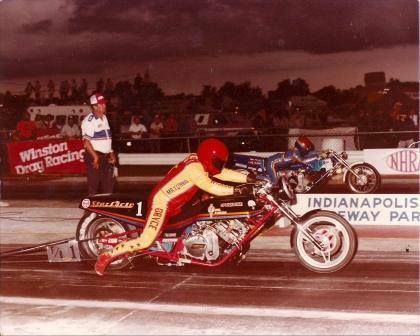 A legendary Funny Bike showdown, George Bryce vs. Terry Kizer in the mid 80s. That’s not to say Bryce thinks the historic first five-second turbo run would come easy. Paquette, of Michigan, was the most recent leader in Funny Bike performance. He had a machine capable of 6.3 performance, before selling his bike. 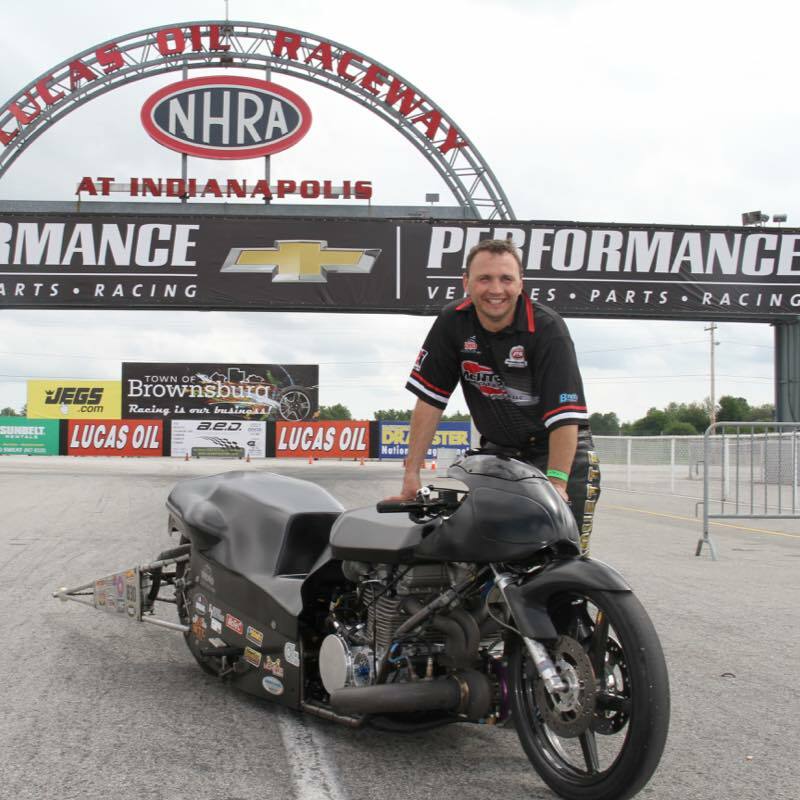 Timblin saw room for improvement on Paquette’s bike. “It is a little short and I don’t think he was as wide as he should have been on the rim,” Timblin said. 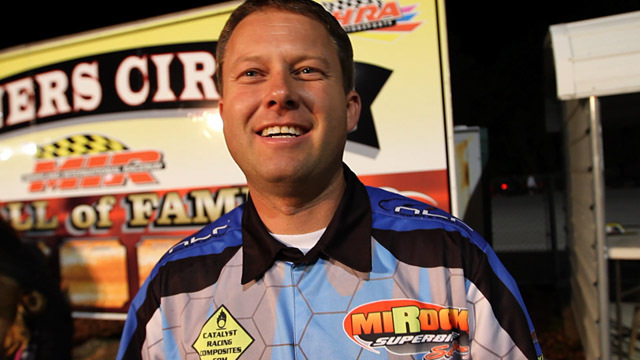 Timblin feels he could build a chassis that would take a Funny Bike into the fives. As for the 6.50, where did the dramatic increase in performance come from, vis-a-vis Outlaw Pro Street bikes of the past which ran in the 7.20 range? 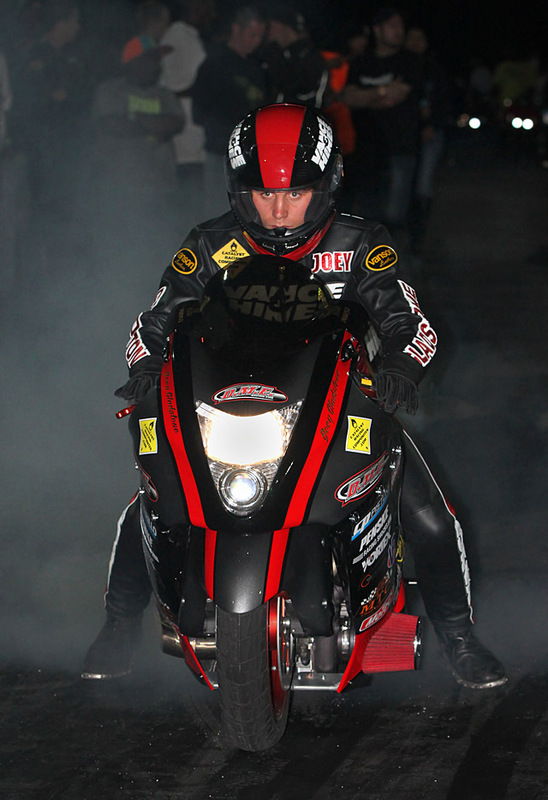 Joey Gladstone and Team DME found much success with the turbo-charged Hayabusa motor in Pro Street. 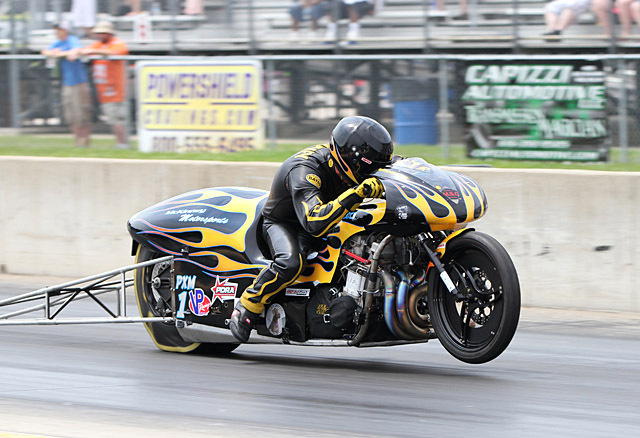 Longtime Pro Mod competitor, builder and tuner, Rob Bush of Rob Bush Motorsports, also believes a Funny Bike utilizing all of the modern resources could be in the fives. Bush astutely points out; nitro could have helped accomplish the goal. Does Eddinger feel he could put a Funny Bike in the fives? 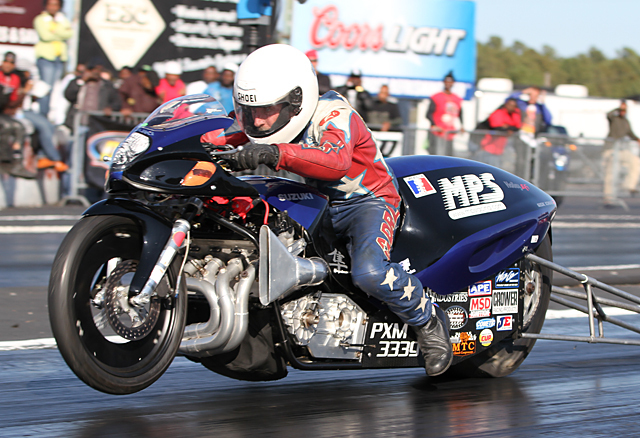 Joey’s father, Skip Gladstone feels confident his team could build a five-second turbo motor. 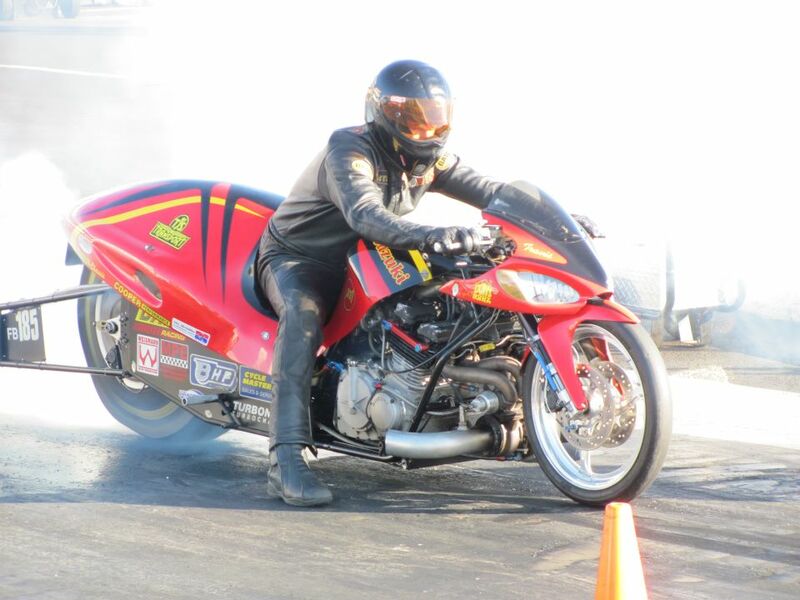 “To run a five with a Funny Bike, I would use the same tire they use in Pro Stock Motorcycle to eliminate parasitic drag. A big tire hooks up better but it is always a horsepower drainer,” Gladstone said. It seems the debate over ideal tire size is just as controversial as the debate over whether a five-second turbo run is possible. 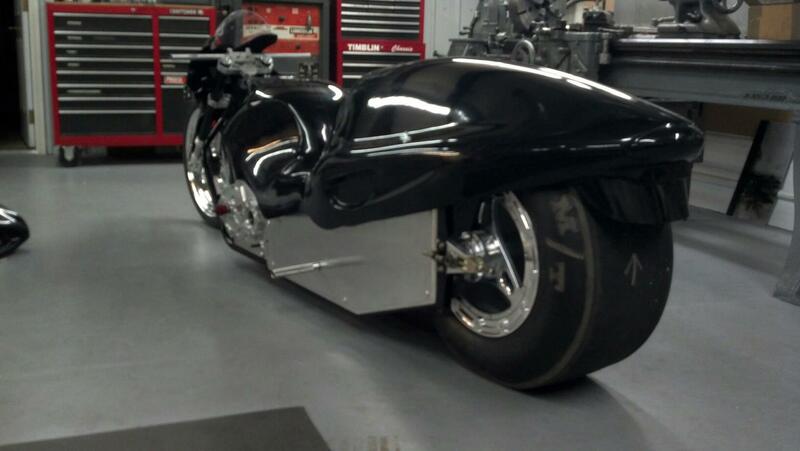 McBride uses a massive tire on his Top Fuel motorcycle, a 14-inch Mickey Thompson. 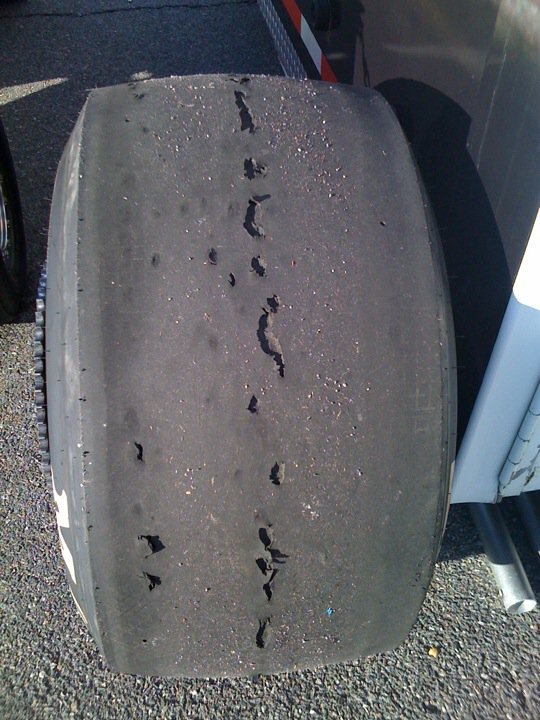 Larry McBride’s 14-inch slick after smoking it due to lack of traction. 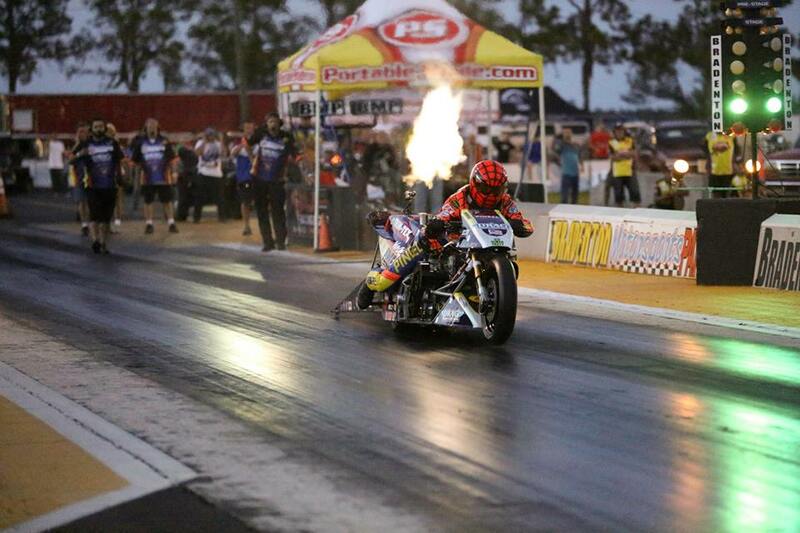 Bryce has a different formula for selecting the correct drag slick. Bryce also added some insight, which may explain why tire size is such a debatable issue. Timblin says the 6.50 no-bar pass inspired him. 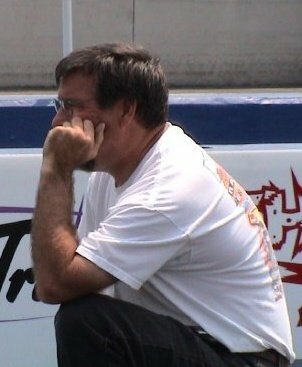 Referring to Gladstone’s jaw-dropping Outlaw run , Timblin says if a guy can go 6.50 on a small tire with no wheelie bar, a Timblin chassis with wheelie bars would definitely go in the fives. 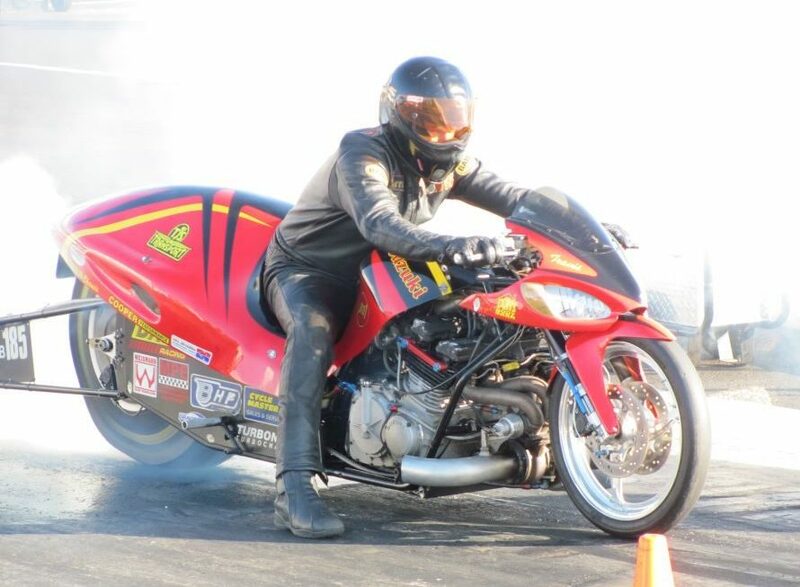 Timblin is working on one state-of-the-art Funny Bike for a racer out of Greece who will compete at Santa Pod Raceway in Bedfordshire, England. Eddinger would love to see one of his customers try for a five-second turbo run. The learning will certainly require money, which may be the most limiting factor of them all. The experts are all in place. It’s just the financial backing which needs to materialize. Who will be the first team to put a turbo in the fives? Here’s hoping for a Funny five in the near future. As George Bryce says, if tire size requirements change as a bike travels down the strip, perhaps using a couple of small tires mounted side by side might work. Tire distortion may be minimized while more contact surface is accomplished.